WASHINGTON (CNN) -- President Obama said his administration will offer a hand of friendship to the Muslim world but will hunt down terrorist organizations that kill innocent civilians. President Obama has taken an early interest in the Middle East peace process. "My job to the Muslim world is to communicate that the Americans are not your enemy," Obama said in an interview with Al-Arabiya, the Dubai-based satellite television network. "We sometimes make mistakes. We have not been perfect." During his run for the White House, Obama pledged to improve ties with the Muslim world, draw down U.S. troops in Iraq and close the detention camp at Guantanamo Bay, Cuba. The president also has pledged to address the Muslim world from a Muslim capital in the first 100 days of his administration. No location has been announced. Obama said the United States will go after terrorist groups that kill innocent civilians but will do so while respecting the rule of law. The president said that difference makes America great. The Obama administration also has taken an early interest in the Middle East peace process between the Israelis and the Palestinians, with the president naming former Sen. George Mitchell as his special envoy to the region. Mitchell is scheduled to arrive in the Mideast on Tuesday to shore up a fragile cease-fire between Israel and Gaza's Hamas leadership. A tentative cease-fire between Israel and Hamas-ruled Gaza began last week after a three-week military operation by Israeli troops in the Palestinian territory. "Ultimately, we cannot tell either the Israelis or the Palestinians what's best for them. They're going to have to make some decisions," Obama said. "But I do believe that the moment is ripe for both sides to realize that the path that they are on is one that is not going to result in prosperity and security for their people. And that instead it's time to return to the negotiating table." Obama said the United States will start by listening, not dictating, and then a response will be formulated after consultations with all the major parties involved. 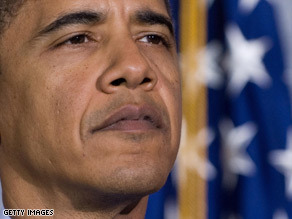 iReport.com: What should Obama do first? Obama's interview was seen widely in Pakistan and has received a generally positive response from analysts there. Islamabad author and journalist Imtiaz Gul told CNN: "It's a good sign of an attempt to reconcile with the Muslim world, to say America wants to reach out to them and not to consider them as an enemy." Analyst Zaid Hamid said that Obama has yet to win the hearts and minds of the Muslim world. Hamid said the real litmus test for the Muslim world is what Obama does with the crisis in Gaza.